The Wright at The Guggenheim. New York City museums are catching up –- to Paris, which boasts the knockout George restaurant in the Pompidou, and to England's dazzling glass box of a restaurant on top of Oxford's Ashmolean Museum. The newest New York museum dining incarnations are at the Guggenheim and the Museum of Arts and Design on Columbus Circle, with Danny Meyer set to transform The Whitney. And both MoMA and the Neue Galerie have dining enticements as well. The Guggenheim's The Wright has the advantage of a private entrance off Fifth Avenue at 88th Street so that locals can be enticed by a buzzy bar scene and trend-setting decor. Contemporary and chic, The Wright has a twisting communal table, a European-style bar featuring popular small plates –think oysters on the half shell with apple mignonette — as well as a lunch bar, and full dinner menu. A David Bouley protege chef, Rodolfo Contreras, is responsible for what's billed as the "modern American menu." The big draw – along with a much-needed Upper East Side restaurant where the choices are currently pretty slim – is an extra-festive, exuberant, site-specific sculpture by British artist Liam Gillick. The Wright is now open for lunch and dinner, although many locals can't wait to sample the brioche French toast with berry compote at Sunday brunch. 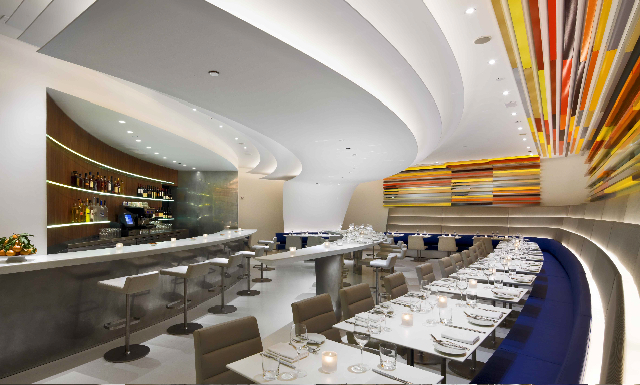 The Wright accepts reservations by phone, 212-427-5690, and at Open Table. The Museum of Arts and Design's (MAD) theatrical new restaurant is Robert, located on the top floor of the 2 Columbus Circle museum. 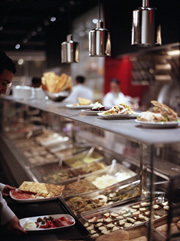 A sparkly grand space in lucite and silvery metal, it too has a communal table and American fare. The views are a match for the decor — the Columbus Circle fountain, the glass walled stage of Jazz at Lincoln Center, and an eye-level close-up of the statue of Christopher Columbus. A central lounge area fitted out with comfy sofas is the best place to enjoy the scene at night. Art, as you might expect, takes center stage, with a mobile-like chandelier installation of LED Lucite panels and suspended orange Lucite boxes along the windowed perimeter. A new video art piece, entitled "Orbit 2" by Jennifer Steinkamp, is displayed on a 103-inch plasma screen. Robert is open from 11 to midnight for lunch, afternoon tea, dinner and late night cocktails. Reservations also at Open Table and by phone: 212-299-7730. MoMA has always offered a tasty lunch menu at the communal tables on its second-floor Café 2, but on the first Thursday of each month, museum hours will be extended. From January to June, MoMA will be open until 8:45 and a new three-course prix fixe dinner, an affordable $25, should satisfy even the most ravenous museum visitor. Alas, unlike the Guggenheim and MAD, the regular $20 museum admission applies, although you can skip the admission fee on Fridays from 4-8 pm. Thursday MoMA Nights will include music by DJs and a cash bar. Gallery talks (free) will be offered at 5:30. 6:30, and 7:30. The regularly scheduled films are included with the price of admission. For details: 212-708-9400. Keep in mind that the wildly popular "Tim Burton" show is on through April 26. You can obtain timed tickets online, optional during the week, but required on weekends. Cafe Sabarsky at the Neue Galerie. The Neue Galerie on the corner of 86th Street and Fifth Avenue will now offer free admission from 6-8 pm on the first Friday of each month. What you save by skipping the usual $15 entrance fee you might spend at the immensely welcoming Café Sabarsky, named after the museum's co-founder Serge Sabarsky. The star of this collection of German and Austrian art is Gustav Klimt's 1907 portrait of Adele Bloch-Bauer, one of the most expensive paintings in the world. Cosmetic tycoon Ronald Lauder bought it in 2006 for $135 million. The café, a dead ringer for a venerable Viennese coffee house, has Josef Hoffmann lighting, Otto Wagner-style upholstery, newspapers hanging on a wooden rack, and what has to be the best Viennese hot chocolate "mit schlag" (whipped cream) this side of the Danube. The "apfel strudel" is not too shabby either, while the sacher torte's a triumph. You can opt to have lunch or early dinner without paying museum admission, but then you would miss out on seeing the collection and Annabelle Seldorf's masterful renovation of the former home of Mrs. Cornelius Vanderbilt III. The Neue Galerie is at 1048 Fifth Avenue. Details: 212-628-6200. 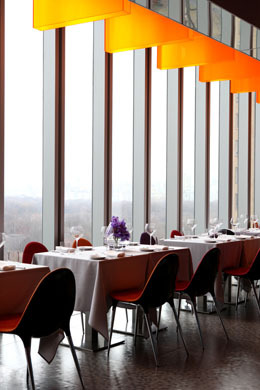 Like MoMA, The Whitney is also going the Danny Meyer route. Meyer's Union Square Hospitality Group has taken over from Sarabeth's and will reopen late this year with a new menu and updated decor. But in order to handle the ravenous crowds descending for the always controversial Biennial (which runs Feb 25-May 30, 2010) Meyer has rounded up his best chefs to open a pop-up restaurant in the museum called Sandwiched. 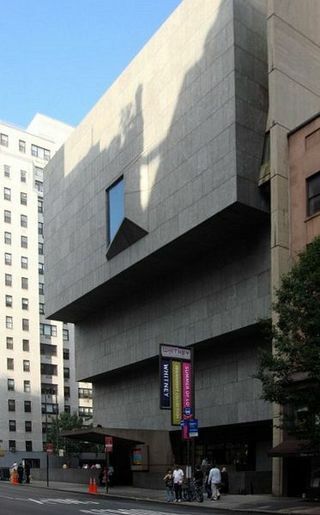 The Whitney is closed Monday and Tuesday with pay-what-you-wish admission on Fridays from 6-9 pm. The Wall Street Journal, Travel & Leisure, and Departures. Currently she is a New York correspondent for Art & Antiques.